It frosted last night. We’ve been on alert the last few days, waiting for the inevitable; still, it was a surprise when Elizabeth told me that she saw frost on the grass this morning. As if in doubt, she tiptoed outside and peeked over the edge of the drained swimming pool. A thin layer of ice had formed on top of the remaining water–a sure sign that the frost was real and not just a figment of her imagination. I grow sentimental every time the cold returns, knowing that all I hold dear is about to pass away until next year. Goodbye to the cheerful chirping of the crickets, goodbye to the tender eggplant blossoms, and goodbye to the cucumber vines that wrap their delicate fingers around the nylon netting of my husband’s “Cucumber Haus.” The joy of growing a garden and the delights, therein, will have to wait for another season, for now the ground must rest. I’m never really prepared for the drastic change in temperature. Surely I could have spent more mornings at the garden’s edge, sipping coffee and reading my Bible or drawing a nature specimen under the tree by the fence. But, it was such an ill-tempered summer – too hot– with barely a drop of rain. It certainly won’t go down as one of my favorites. Anyway, it’s too late now. Just to prove it the tomatoes were drooped over this morning like old women – mere shadows of their former glory. The over-ripe fruit hung low on the vines, mottled and translucent from the penetrating cold. 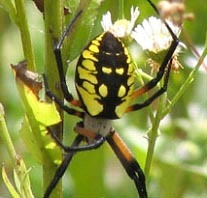 I looked among the leaves for signs of the black and yellow garden spider. I remember other days, more temperate, when I saw her strung like a single jewel on gossamer thread, basking in the sun’s warm rays. But she, too, has shriveled away in the night. I think I’ll miss her most of all.